Fine interview recently with Lean Insider. Here are some highlights. What motivated you to originally write the book Lean Production Simplified? 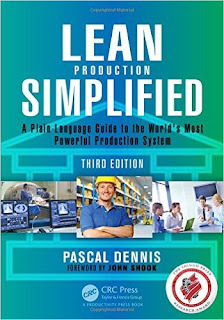 I wrote the first edition of Lean Production Simplified hoping to share what I’d learned at Toyota. I felt that if I could explain things simply, then perhaps I had gained a certain level of understanding. During the past 20 years, I’ve been the sensei helping companies apply the Toyota system or Lean. Why did you write the 3rd edition? My coaching practice has taken me far from the Toyota shop floor – into hospitals, power plants, container terminals, and research laboratories. And the more I learn, the more I think of Socrates -- "The more I know, the more I realize I don’t know." Hospitals, banks, universities, software developers, government agencies and other service providers are hungry for Lean thinking and methods. Their customers will no longer accept substandard safety, quality, delivery, or cost performance. I’ve added many more examples from outside the factory (e.g. design, engineering, administration, etc.) and from the industry sectors I mentioned earlier. I’ve also included study questions at the end of each chapter. How does Lean related to the martial arts? My study of aikido helped prepare me for Toyota. I quickly realized the Toyota Way is a "do" or path, and that the Toyota shop floor is a dojo -- a place where you practiced a profound art or worked on your technique and on yourself. Indeed, before stepping on to the shop floor, I felt like bowing -- a sign of respect for my team, organization, and the art of management. I still feel that way.